The C-Brats :: - First boat advice, please. Posted: Wed Feb 06, 2019 6:42 pm Post subject: First boat advice, please. I am retiring to somewhere (not quite decided yet) on the British Columbia coast within the next 18 months. I currently live in Oregon. I want to experience boating, on the ocean, in a modest manner. I do not have any serious sea-going boat experience. I am looking for a trailerable, easily-handle and safe boat with some weather protection and the ability to spend one night (2 people) afloat with a modicum of comfort. I am attracted to the C-Dory line. I will not have the years available to me to graduate successively from dinghy-to-yacht, so I would like to purchase a boat that I can live with for maybe 10 years. I see that the purchase of a used boat in the USA before I return to Canada makes sense in terms of both cost and choice. The question is: Is the C-Dory 22 too much boat for a first boat for someone with my lack of experience? murthog, Congratulations on so many levels. 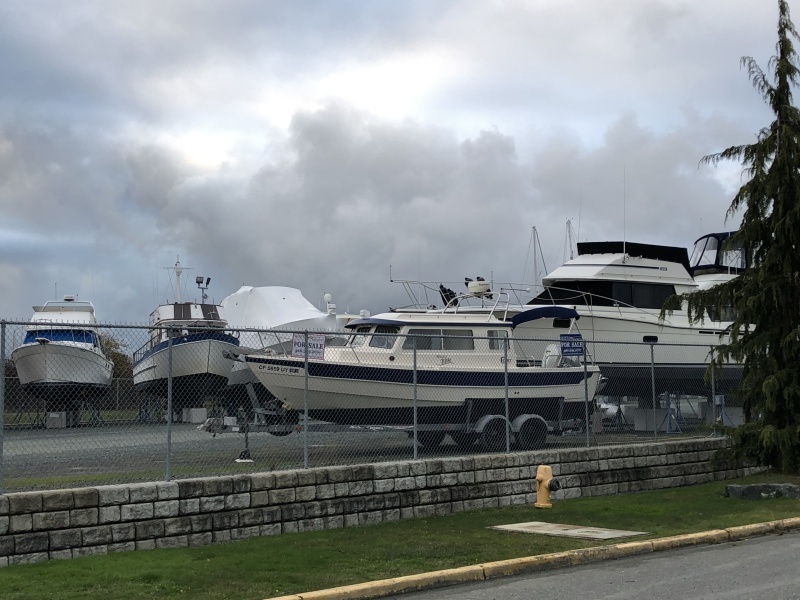 Picking the right boat, going to the right community for contact with real people who do what you want to do, for deciding on going to the BC coast, for retiring. You are doing so many things right. I have a 22 Cruiser and have been single handing it for the last 9 years. Easy to do, and plenty of room. Room for 2 if you want too. Much of the time the BC coast between Vancouver Island and the lower BC coast is pretty easily doable. Yes, you have to watch the weather and tides, but that's not hard. It does not take a Captains license to navigate around the islands. (Of course that would/should make you a much better mariner though.) The 22 is easy to trailer, easy to manage a launch or retrieve, easy to handle on the water. You should take (and I believe you will have to have in BC,) a boater's Basic card class. US CG Auxiliary or Power Squadron will offer that down here. (Not sure in BC). Come up to the Friday Harbor gathering and take a look at the boats, meet the people that use them, love them and talk them, and see what there is about them that appeals to you. You don't have to own a boat to come and enjoy a weekend with great folks. "The question is: Is the C-Dory 22 too much boat for a first boat for someone with my lack of experience?" The Answer is: It is up to you. Boating can and will be what you want it to be, or what you make it to be. If you are average intelligence, (and you are already above that you came to C-BRATS), you can learn what you need to operate a boat. You can learn the basics of safety and navigation. If you are reasonably mobile, you can handle the launch and retrieve, the boarding from a dock, and stepping up out of the cockpit or down into, and getting into and out of the V-birth. The average C-Dory boater is generally leaps and bounds ahead of the average boater in many regards. You came to the right place, and you are already ahead of many. What part of the country are you in? Have you seen a C-Dory up close? Are you available to go out some time if one was available? Do you have a tow vehicle? (or do you plan on keeping it on the water full time?) Where are you looking at in BC? All might be helpful in making the answer to your question more specific. BTW, I grew up in BC (southern Vancouver Island) and that is where I got Salt water (we called it chuck) in my veins. It never goes away. The answer to your question is that any of the C Dory are not too much boat to start with. In some ways easier than many other boats. I like to say the 22 is the VW camper of the boating world. It is a wonderful compromise between easily to handle, easy to trailer, and some people even live aboard them full-time. We spent a month at a time on our 22's--usually 2x a year. Now we have moved back up to a 25--a bit more room, an enclosed head, with small wet shower. A bit more to trailer, but still one person can handle it. Go to the Friday Harbor Gathering! In BC, you will need to obtain a PCOC (pleasure craft operator card). You can get this online if you wish.. This forum is a great place to learn. Smart decision to consider a C-Dory for your first boat. As a newbie, you can help your learning curve by taking the Power Squadron or US Coast Guard Aux Safe Boating class. Even before you get a boat. Pick up a copy of Chapman's Piloting and Seamanship - that alone should keep you busy for a month or so. Walk by some marinas to see what boats people are using. All that said, every newbie learns by making mistakes. The more you can be exposed to ahead of the boat purchase, the better to go into it with eyes wide open. It is also nice to have a boat that will take care of you as you get into your learning curve - and a CD-22 will be great for that. It isn't necessary to go from dinghy to skiff to runabout to cabin boat. You will hear from some people that driving a boat is like driving a car. Do NOT take advice from those people. There are more differences than similarities (a boat steers from the rear, wind will move a boat sideways - if your car is blowing sideways, you should have taken cover already; there are no "brakes" on a boat, but you can learn to control the movement; you don't have to tie your car to the curb, etc, etc). You can pick some of that up here, but a dedicated class and practice will take you further. I would even go so far to suggest you hire a small boat captain to take you out in your boat and give you a thorough orientation for how to dock, slow speed maneuver, back & fill, safety procedures, launch and retrieval. Welcome aboard here - wish you all the best as you prepare yourself for this next exciting chapter. I recommend "the 3 Rs"
It's difficult to win an argument with a smart person and almost impossible to win an argument with a dumb one. So, why do it? wild and beautiful coast of British Columbia and Alaska for yourself? How about up close and personal, in your very own boat? In this book, we’ll describe how you could make that dream a reality, in a small (trailerable) boat. If you’ve ever taken a cruise ship up to Alaska, along the way you may have noticed a few lucky folks poking along in their own boats, watching the whales, pulling in salmon or crab, or heading off to anchor in a secluded cove. With a closer look at these private cruisers, you might observe that they’re not nearly as small as they appear from a distance. They might be affordable only with some really serious money. And then there’s the cost of fuel. So, you think, we sure couldn’t afford cruising like this. Cindy and I have been lucky enough to spend more than 1,000 days cruising some 30,000 miles in our own small boats, mainly on the pristine waters of the Pacific Northwest. We aren’t wealthy, and we sure didn’t come into cruising as expert boaters – far from it. We were tent campers, who enjoyed fishing and liked being around the water. We’ve wandered the Inside Passage as far as Glacier Bay, and floated in front of the great tidewater glaciers, while they calved huge chunks of ice. We’ve been surrounded by whales, porpoises, sea otters, seals and sea lions, dozens of eagles, and bears prowling the shoreline. We’ve feasted on succulent Dungeness crab, huge spot prawns, salmon, and halibut – all caught by us. In so many wonderful anchorages, we’ve been absolutely enchanted by the beauty all around us. So how did tent campers become cruisers? While camping on Vancouver Island one summer, we decided to go out for a day with a salmon fishing guide. It was dynamite - beautiful, exciting, and great fishing too, all in a 16-foot boat. Months later, we wandered into a boat show, thinking we could probably afford such a boat. We looked at quite a few, but none really knocked us out. Then we set eyes on a little cabin boat that really stood out from the crowd. It was a C-Dory 22 cruiser, not too much bigger than the fishing boats we were considering, but with a huge difference - it was designed for “camping on the water”. We spent several hours checking out every aspect of the C-Dory. After two more days at the boat show and lots of discussion, we were sold. That little boat turned out to be one of the best decisions we ever made - a perfect choice for beginning cruisers. She was seaworthy as can be, built with quality, and very cleverly laid out to make the most of her 22 feet. Her cabin sheltered us from the weather, and had windows with all-round visibility. She had good cooking, eating, and sleeping facilities. With her 90hp outboard, she could cruise at 18-20 knots (21-23 mph), and travel 170 nautical miles (195 statute miles) on a tank of gas. With this boat, we were able to spend peaceful weeks sightseeing on Lake Powell in southern Utah, then weeks and months exploring the Inside Passage of the Pacific Northwest. The Inside Passage, a stretch of coast roughly 1000 miles long, runs northwest from Washington’s Puget Sound up to Glacier Bay in Southeast Alaska. It’s called the Inside Passage because its waters are protected by countless islands, in a mostly unpopulated area often 100 miles wide from east to west. Roads reach only a very small part of this wild, out-there place. It’s some of the finest cruising anywhere. If you can afford a reliable small boat, cruising the gorgeous PNW coast really is possible. It doesn’t have to cost an arm and a leg. Yes, the boat can set you back some serious cash – maybe $30K to $50K for a small or older cruiser, or $70K to well over $100K for one that’s new, larger, and more elaborately equipped. Boats certainly aren’t investments (except in your mental health and well-being), but if a new one strains the budget you can save a bundle by choosing the right used one. Upgrade a few things, take good care of it, and it should hold its value. How much time do you spend traveling at high speed? Especially in a heavier boat, going slower can double or triple your miles per gallon (and your range on a tank of fuel – handy for exploring remote areas). It can also reduce wear and tear, while increasing your enjoyment. How much time do you spend at marinas, rather than at anchor? How often do you eat at restaurants, rather than on board? How much routine maintenance will you do yourself? Paying someone else to take care of your boat can really put a dent in your credit card. What sort of a boat are we talking about? You certainly could go cruising in a small sailboat, but sailboats aren’t our focus. In this book, we’re discussing small power cruisers, small enough to tow on a trailer. A larger boat that has to be kept in a slip will generally cost a lot more – partly for the boat, taxes, and insurance, partly for the slip, and partly for the wear and tear created by sitting in salt water all the time. A towable Inside Passage cruiser is probably at least 21 feet long, and could be 26 or 27 without exceeding the typical 8½ foot maximum towing width. A 28 or 29 footer could be towable, but you might need a wide load permit. For the PNW, a cabin is pretty much a requirement. We’ve seen a few folks cruising in open boats with enclosures, or boats with a cuddy cabin and an open helm, but we’d recommend a different choice. After all, a good part of the Inside Passage is known as the Rain Coast. Even if you stick to relatively sunny areas like the San Juan Islands, you will be spending some time in rain. A really functional, livable cabin, with good visibility all around, will make cruising a lot more comfortable and enjoyable. In this book, we’ll describe boat designs, equipment, and techniques that work for us (or folks we know well). Of course, our suggestions aren’t the only way to do things, but we know they work for us. We’ll mention some brand names, so you can have examples of what we’re talking about. We do not imply that these are the only ones you should consider, or that they are the best – only that we or our friends have had success with them. Extended cruising of the Inside Passage is not without its challenges, but it certainly is do-able by mere humans like us. We learned step by step. I had fished from skiffs with small outboard motors or oars, and done a little charter sailing in the Bahamas. Cindy and I had done some canoe paddling, but we knew nothing about owning and operating a power cruiser. Luckily for us, the C-Dory was an uncomplicated but very sound and seaworthy boat. It was a great learning environment - we concentrated on boating skills, not on stuff that didn’t work, or systems we just didn’t understand. Before we took delivery, we attended the Boating Skills and Seamanship course put on by the Coast Guard Auxiliary. It cost only a few dollars, and couple of hours for each of six weeks – well worth it for us beginners. For two years we were lake cruisers, staying out at first just a few days at a time, then working up to a couple of weeks. We built boating skills at Lake Powell, a low-risk and delightful place, with drop-dead gorgeous red rock canyon scenery. We learned what to take with us, how to load and provision the boat, towing, launching, docking, anchoring, boat handling in various conditions, and many aspects of living successfully aboard a small boat. In our third year of cruising, friends in Seattle suggested that we tow up to Washington and meet them for a couple of weeks on the ocean. What an opportunity! A guided trip in the San Juan Islands and into British Columbia, expanding our envelope of skills and experience. For our first ocean trip, we had to be prepared for many new things: tougher weather, bigger waves, huge tides, rapids, rain, fog, charts, navigation skills, and different kinds of fishing. We did our homework, and the cruise was a great success. It was convenient that our boating buddies were leading the way, but with a cruising guide book and some common sense, we would probably have been OK in the San Juans. We planned ahead, and paid attention to what we were doing and how well it was working. As we ventured further north on subsequent trips, we encountered greater challenges with weather, waves, and distance. We took it one step at a time, learning as we went, rather than making great leaps beyond our abilities. Over the next two summers, we spent six weeks cruising southern B.C. We had built up our skills to a pretty solid level, while both of us still held demanding jobs. Then came an opportunity to expand our envelope in a big way: both our employers were flexible enough to let us take extended leave. We thought about it for a while, and decided to really go for it - a summer’s cruise in Southeast Alaska. It was incredibly wonderful, the experience of a lifetime. Since that first Alaska trip we’ve done many more long cruises, continually improving our skills, and loving (almost) every minute of it. Posted: Thu Feb 07, 2019 10:51 am Post subject: First boat advice. Thanks for the great response! I can only say that such an enthusiastic, informative (and VERY prompt!) response validates my choice of boat! It is my experience that in any area of hobby or recreation, the interaction with others of like mind and interest is as important as any choices regarding equipment and accessories. I appreciate the time that you have all taken and I hope to respond individually to all messages. For now, this is a note of appreciation to you all. Please continue to send your thoughts. I think a 22 or 25 would be great first boat. The C-Brats are gathering in Friday harbor in May ( look for the post) . There should be about 20 boats there. Some times more. It would be a great place for you to come see C dorys of every size and color. Talk to the people that run them and maybe even get a ride. It would be worth your while to show up. As foggy said go rent some boats. Find a lake that rents 14 ft alum boats with outboards and just spend a whole day on one. learn how to run it, how to maneuver it and just get a fell for it. The best motorcyclist I know all started out on mini bikes and the best boat handlers I know all started out in small aluminum fishing boats on a lake. If you still like boating after that go rent a ski boat for a day. Lots of places to do that. You will learn more about how a boat handles in the water doing this then you will in a life time of in door classes. Classes will teach you all the rules and customs, weather and tide prediction etc but nothing teaches driving like doing. I have been around small outboard boats and heavy trucks my whole life. I do not think I am the best at driving either but there is not one that I cant drive. Feel free to ask any question you have here. Alan, if you are in the Portland area, I’m happy to take you out in our C22 Cruiser sometime and let you check it out. Just PM me and we can figure something out. This is our first real boat and I’ve learned a lot, but it’s very a great learning process and we are planning our first trip to the San Juan’s in May. It is a wonderful compromise between easily to handle, easy to trailer, and some people even live aboard them full-time. C-Dory's are a completely flat bottom boat. That gives them great stability from rocking when at rest (e.g., at anchor); it gives them great fuel efficiency; it allows them to plane at slower speeds; it gives them the ability to go into very shallow water (or at least lessen the chances of getting in trouble with land); and other advantages. One big disadvantages of a flat bottom is that a C-Dory will pound in the chop -- some folks will find this unacceptable since pounding is not comfortable and "feels like" the boat may be in danger when it's not (note pounding can be minimized by slowing down....often to hull speed). The other disadvantage is docking. Think of a C-Dory as a leaf on a windy lake. C-Dorys get blown around easily in all directions. Boats with more of a keel (usually called "displacement" boats) are far more directionally stable in wind while docking. Personally, I am very glad I had lots of experience docking with a keeled sailboat before I had to learn to dock with a C-Dory. Lastly, as a first boat, I would prefer handling a trailer, as well as launching/retrieving, with a 22 than a 25. 22s weighs about 4000 pounds; a 25 weighs maybe 8000 pounds. All of that land-based trailer stuff will be much easier with a 22. P.S. One way to mitigate the docking issue is to have twin engines. The "V" the bottom of the boat at the transom (back) is called "dead rise". It is usually defined by the degrees on each side at the transom--24 to 25* is about as severe as it gets. The C Dory angle is very flat at the trams with only 2-3*, but the hull shape forward has more V--and as much as many other boats. Thus the trick is to put the boats bow down where going into waves (short waves wind driven, are called "chop". A C dory equipped with both Trim Tabs (which are attached to the transom and force the boat's bow down (or transom up) on each) can affect both side to side trim, as well as front to back. There is a device called a hydrofoil--the best for the C Dory is a "Permatrim". Which attaches to the lower unit of outboard motor--that will help force the bow down even more--going into waves. I have owned boats with the deepest V--and they also can pound if driven too fast for the conditions. (don't trim the bow down severely when going down wind and waves--there you want It up--and again the Permatrim allows more versatility than just the motor. I have owned trailerable boats for over 60 years..yet I still prefer to keep a boat in a slip in the water. Again, the ease of trailering depends on the setup of the boat and trailer--as well as skill. Recently at the end of a several week and nearly 800 mile cruise--we had 3 22's and one 25 to pull out on the trailers. The 25 was the easiest of the boats to take out, because of the way the trailer was setup (using "target bunks" to guide the bow correctly into place.) Some brands of trailers are set up better. Again you have to observe a number of the boats and how they are handled--plus the practice. We all have our preference--and develop skills differently. I doubt if any other boat could have brought us rank amateurs through the places we explored in those two years as safely & comfortable as the CD22. From the experience gained through doing, we have gone to make many more even grander adventures in SE Alaska & the Yukon River & though still learning the capabilities of the CD22 no longer consider ourselves armatures. If interesting in learning more from reading & photos here are listed our other SE Alaska cruises. I certainly don’t advise you to start & do as we did, but it does show the capabilities of a CD 22 in the hands of the unexperienced learning on the go. They have a C Dory 25 and Weldcraft 201 and offer training. You could get some real world experience on a few boats with a professional to answer all your questions. They also have larger boats and you might eventually aspire to go bigger.